Through our VoIP services Telzio is able to support grassroots organizations like Child and Family Services of NW Michigan (CFS) who are locally based and making a difference at the ground level. One of the ways we can offer support is by sponsoring their annual telethon hotlines, which raise money and awareness for their programs. 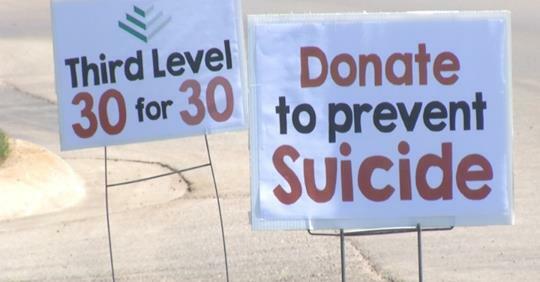 This year the telethon raised $30,000 for their suicide and prevention program, Third-Level. CFS works in 20+ counties throughout Michigan, and files roughly 30,000 contacts through calls, texts, and visits each year. One of their programs,Third-Level, helps people of all ages with life challenges – from financial struggles to bullying to thoughts of suicide. About 150 calls a week are related to suicide prevention so we’re one of seven crisis centers in Michigan that are contracted with the National Suicide Prevention Lifeline Network so someone from a Northern Michigan area code calling those national numbers are routed here to Third Level. The annual 30for30 telethon raises money and awareness to run the Third-Level program for the rest of the year. A one-day a year event, the telethon provides funding and enables the organization to focus on serving the community. The 30for30 annual telethon raises money and awareness for the Third-Level program at CFS, which keeps the crisis support services running. This year their goal was to raise $30,000, and they were able to meet that goal ($30,000 for the 30,000 contacts). Telzio has been a sponsor of the telethon for the past 3 years, donating a vanity number and phone services needed to support the load of simultaneous calls that comes with a highly-promoted event. We consistently use Telzio for our annual telethon to raise money and awareness for our 24/7 crisis and suicide hotline. Their sponsorship allows us to use more of the funds raised to provide these vital services to our community. Great customer service, great phone service and connectivity, easy and user friendly call flows, and stellar prices compared to other providers we have researched. The telethon is a one-day event, promoted by the organization through mailings, radio, and TV for weeks in advance. Included in the announcements are the phone number and event details where donors can call in to make a donation. On the day of the telethon, the calls start pouring in. Telzio’s system routes calls to agents in various locations, maintaining a queue of callers so there’s never a busy signal. The organization then collects donations over the phone. Here’s a TV clip that ran on a local news station garnering support for the telethon – 30for30 telethon. Based on our experience with telethons, hotlines, and support lines, here are a five best practices that we came up with for optimizing telephone fundraising campaigns. Privacy and data security is such an important topic today, and a serious concern for donors who are thinking of making a donation over the phone. When handling personal credit card information, it’s better to leave it to a professional service that automates the process and has the proper security measures in place. One of the hotline services that Telzio offers is a pay-by-phone feature, where callers can enter their credit card information through their dialpad. The transaction is handled by an automated operator and processed by Stripe, which makes it more efficient and secure than having a live agent collect the information by hand. The pay-by-phone option is flexible when it comes to configuration. For example, you can route callers directly to the automated payment option when they first call in, or you can first route them to a live person who then transfers the caller to the payment service. You can choose a fixed dollar amount for callers to pay, or let them enter their own amount. Once the transaction is completed, you can choose to have the call end there, or have the caller routed back to a live person. Thank you for calling our telethon. Please press 1 to be connected to a live agent, or press 2 to make a donation now. Not only does the greeting let the caller know they’ve reached the right place, it gives them the option to speak to a person or go straight to making a donation. With a telethon event you no longer have to congregate volunteers in one room like the olden days. Volunteers can field calls from any location with the Telzio Mobile App and Telzio Webphone, and there’s no additional cost to add more volunteers. Contrary to traditional phone systems that require configuration of an extra line or extension for each person, Telzio enables you to create as many Users as you need with each phone number. This means you can have a large group of people making and receiving calls on the same number at the same time. All they need is an internet connection to use the VoIP service. Studies have shown that hold music keeps callers on the line up to 25% longer. Hold music is included with your Telzio service, enabling you to choose from different genres and even choose a maximum hold time for the caller. For example, you can limit a caller’s wait time to 10 minutes, and once they’ve reached the time limit, automatically route the caller to a voicemail, other phone number, or payment option. Queues are a sure way to avoid losing callers when phone lines start to get busy. As the telethon activity picks up, each additional caller is placed in a call queue with hold music while they wait for the next available agent. This means that there are no busy signals, no matter how many people are on the line. Again, with Telzio’s pay-by-phone option, you can skip the wait altogether. If you’re advertising the event and telethon phone number, you’ll want a number that’s easy for callers to remember. The number can spell out a word, or simply have repeating or consecutive digits. With the 30for30 annual telethon, we were able to find the vanity toll free number “855-GO-30430”. Depending on if your advertising at a local or national level, you can choose a local or toll free number. The flexibility and reliability of the Telzio platform enable us to provide phone services for telephone campaigns as well as 24/7 emergency hotlines. In many cases, these phone calls are a matter of life and death. Ambulance services, suicide hotlines, and anonymous calls about abandoned newborns are some of the situations that rely on Telzio’s connectivity. Needless to say, maintaining an impeccable uptime is our top priority. Donating telephone services to local nonprofits like CFS helps us make a positive impact for the people in our communities. If you are involved with a social cause and looking for telephone services, we’d love to hear from you. Email us at nonprofits@telzio.com.